Along with homemade salsa, ceviche has to be one of my favorite things to make. I just love the fresh taste once all ingredients are together. Not only is it fresh, light, and easy to make- it’s the perfect protein packed + healthy snack. Taste great on sliced cucumbers or fresh pita chips from Whole Foods. 1. 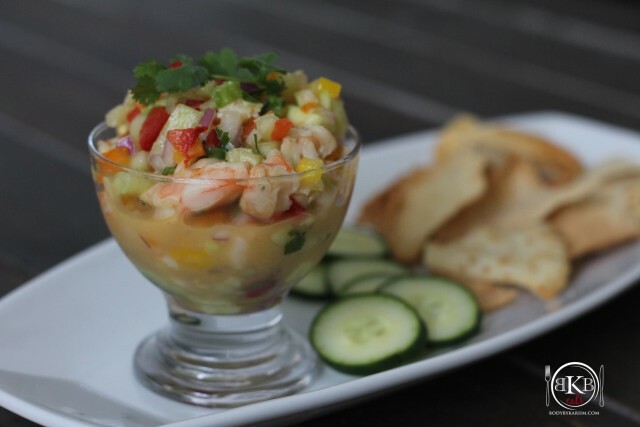 If using raw shrimp: place shrimp in a large mixing bowl. Add 1/2 cup of lime juice and let stand for 15 minutes. (this process will cook the shrimp) *No more or less than 15 minutes. 2. While the shrimp is “cooking” in the bowl, begin to mix the remaining ingredients in a separate bowl. Stir well. At 15 minutes, transfer all ingredients to the same bowl as the shrimp. Cover and allow it to chill in the refrigerator for 2-4 hours. If using cooked shrimp: In a large bowl, add shrimp and all ingredients. 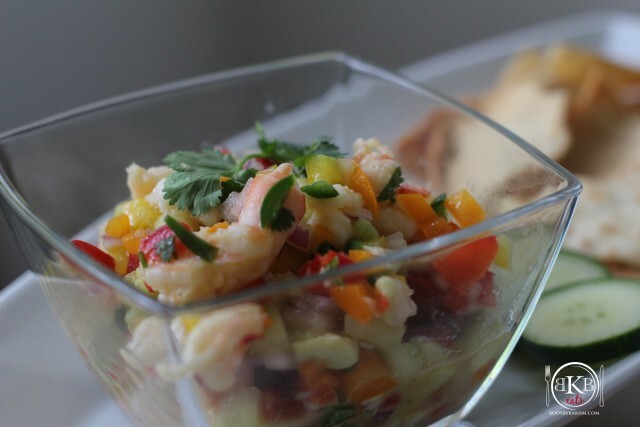 Stir well and place in the refrigerator and allow the ceviche to chill for at least 2-4 hours. If you need to cook your shrimp: Cook shrimp in a pot of boiling water for 3 minutes or until just done. Rinse with cold water to stop the cooking process. Combine shrimp with the other ingredients in a large bowl. Cover and chill for 2-4 hours. This refreshing recipe is better then _ _ _.